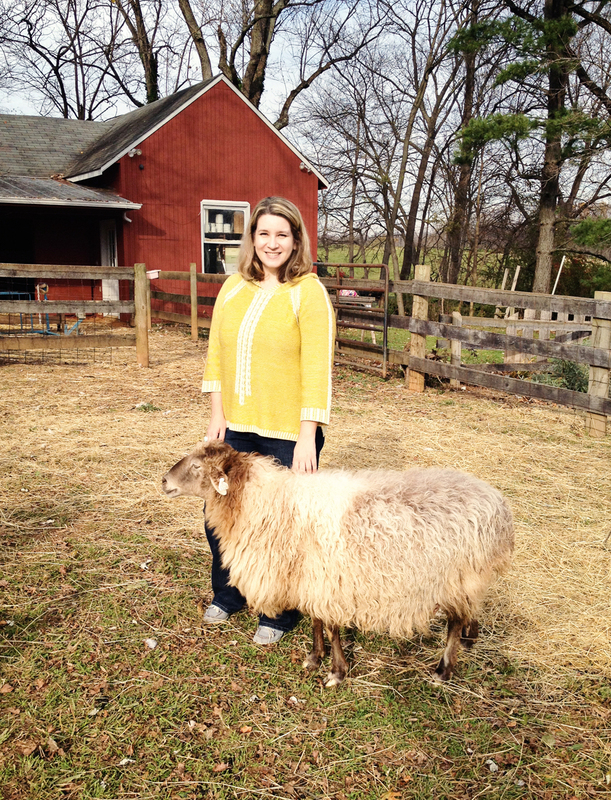 I had an unexpected treat today when I stopped by RedGate Farm in Leesburg to buy some wool fleece. Sue Bundy, the owner of RedGate, was gracious enough to allow me to go there in person and pick out some fleece and show me around the farm. 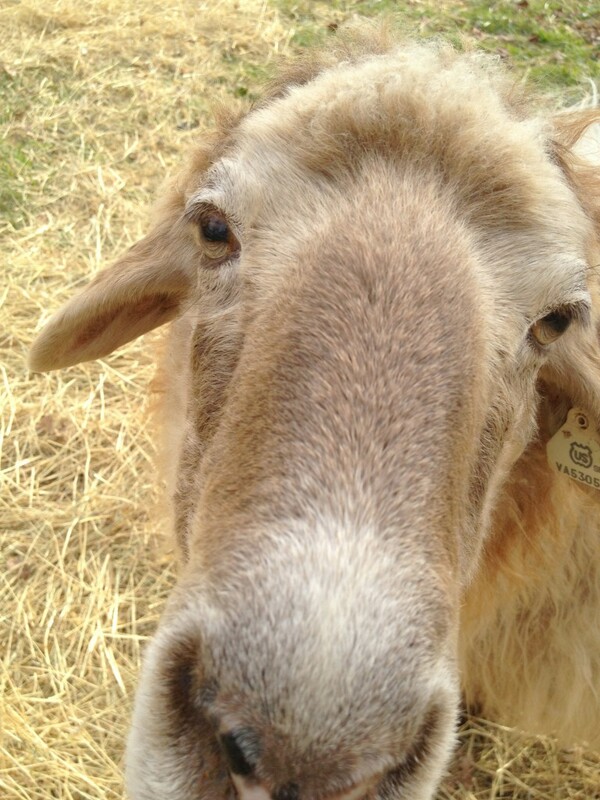 I usually buy washed fleece and roving from her and her business partner at Solitude Wool, Gretchen Frederick. 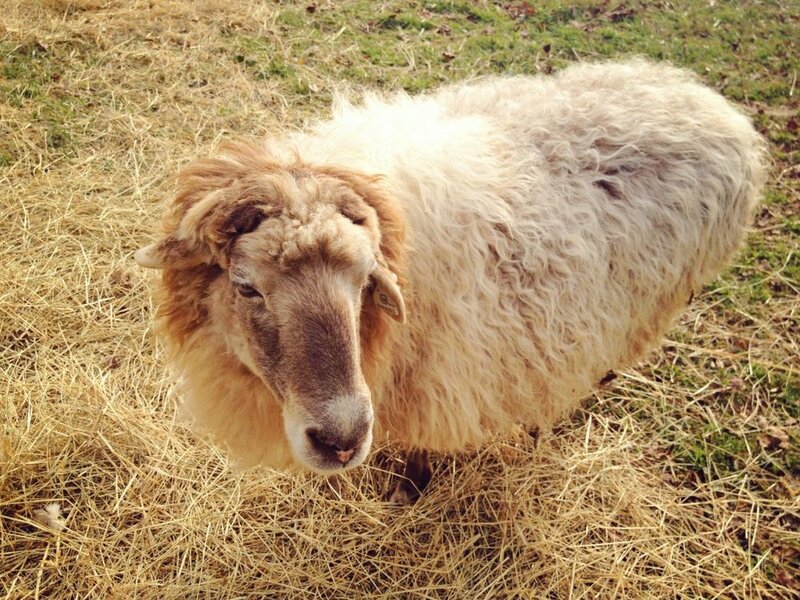 Both raise various breeds of sheep on their respective farms and hand pick wool from local farms to create a range of special breed-specific yarns. The quality and colors cannot be matched by any commercial yarn. Fox5 in DC just did a piece last weekend featuring their yarn business. As a handspinner, I've been a big fan of their washed fleece and dyed locks for a while so I was like a kid in a candy store today picking through bags and bags of woolies. At RedGate they raise karukul sheep, a heritage breed of fat tailed sheep that have a hair outercoat and a down undercoat. Karakul is traditionally used for rugs and is a great felting wool. Karakuls are a particularly beautiful looking sheep. Their fleece was so tempting, but today I was on a mission to get some good all-purpose white wool that I use as a base in my fiber bags and carded art batts. I just love their color tones though - ranging from a warm honey and cream color to cinnamon, chocolate, and blue black. They were just stunning in person. After I picked out some Tunis fleece (a new one for me – I usually buy Romney from them), Sue invited me to go take a look a the flock. I was so amused when she called one of the sheep over by name – “Cookie”, and she came running over to greet us! Apparently Cookie was a bottle baby that Sue raised and she thinks she’s her momma. Cookie immediately came up and started to lean on me as I patted her. She then followed us around like a puppy the whole time I was there. She was so sweet I wanted to take her home with me. Here’s are some pictures of Cookie. 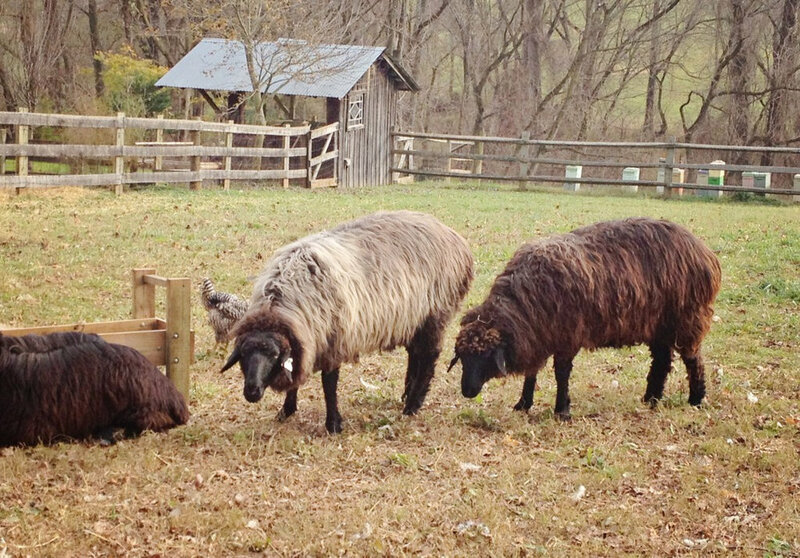 RedGate Farm not only raises sheep, but they have a variety of other animals including Midget White Turkeys and two guard llamas. When I was there the turkeys were hanging out in the trees and their barn cat was napping in the sunshine. 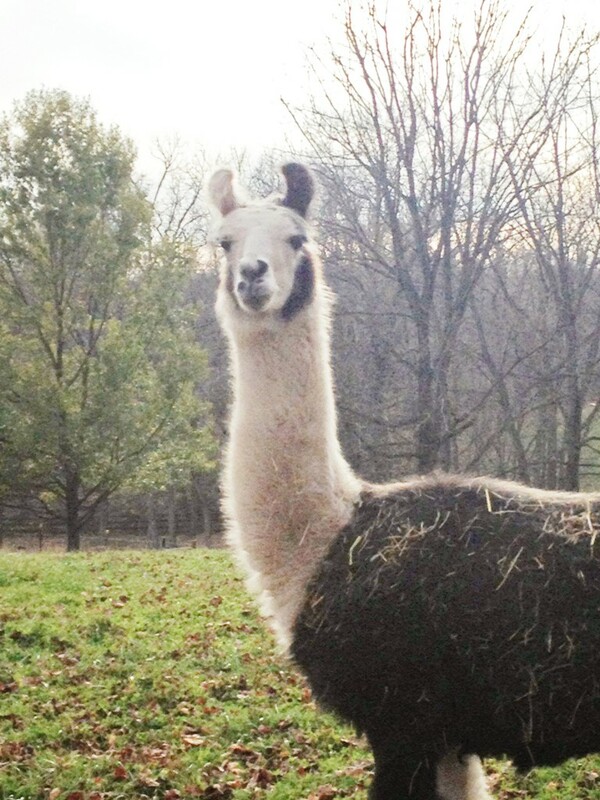 The llamas came over to check me out by giving me a sniff over the fence and then went back to their business. I forgot to ask Sue about their honey bees (I did get some of their beeswax candles though!). Here's a link to an article about their honey. I've heard local honey is good for allergies so I'm going to try it. It was such a pleasant and relatively warm day for November and I felt like the weather was just right for my visit and walking around. I only had my iPhone camera with me though. Hopefully I'll have a chance to visit again in the Spring and take some photos with my Nikon when everything is green and colorful. I found myself thinking about Karakul sheep as I was driving home and I've spent the last hour Googling them. Not surprisingly, I learned that they are known for their "exotic carriage, intelligence, hardiness, common-sense instincts, beauty, and independence". I think this really sums up my impression. I'm so happy that the folks at RedGate Farm have decided to keep this rare breed - they truly are a treasure! You can read more about different sheep breeds here as I continue my quest to spin them all.